Nobel prize winning economist Simon Kuznets once remarked that two countries stand alone for their economic paths, albeit for incredibly different reasons. The first, Japan, industrialized at an incredible rate, and following the destruction of much of its economy during World War 2, rose from the ashes to once again become one of the largest economies in the world. The second, Argentina, rapidly became an agricultural powerhouse, but then experienced a remarkable descent over a few short decades, ultimately transforming into an economy that is numerically similar to that of a ‘developing’ nation. This baffling near-century long struggle begun with Argentina ranking amongst the richest countries in the world, ahead of colonial powers like France and Germany, as well as its colonial overlord Spain. It ended with Argentina ranking amongst the countries with the highest inflation. Decades of political turmoil and governmental ineptitude have crippled Argentina’s economy, and have permanently ruined the public’s trust in the government, to such an extent that even drastic and sound economic policies are barely impacting the country’s astounding level of inflation. As a direct result of this, “even the government must now pay an interest rate of about 25% to borrow in pesos for short periods”, stifling its ability to invest in the country’s future. In the coming days, Argentina is set to (once again) introduce a new currency board to halt the latest free-fall that the peso has experienced, but the consistency of the nation’s inflationary woes is deeply worrying. To truly understand Argentina’s current situation, examining its progressive descent is necessary. Argentina’s inflation rate over the past year. Following its independence from Spain in the early 19th century, and a few decades of internal political turmoil, Argentina celebrated its unification in 1862. From then on, Argentina’s economy soared, benefiting from incredibly fertile land and an abundance of rare minerals. In his book on the early history of the Argentinian economy, Domingo Cavallo detailed that “during this period, Argentina’s economy grew more rapidly than that of the US, Canada, Australia, or Brazil – [and it] outgrew [those] four countries in […] total income, and per capita income.” This made Argentina’s capital, Buenos Aires, a preferred destination for European immigrants looking to relocate to the new world, who flocked by the thousands, further fueling the nation’s economic boom. Argentina continued to experienced exponential growth well into the 20th century, and this growth was only checked by a watershed event that shaped economies the world over. Benefiting from tremendous economic momentum, Argentina’s economy was comparatively mostly spared by the Great Depression of 1929. However, for the first time since 1862, the country was not experiencing booming growth. Argentina’s exports were valued at $1,537 million in 1929, a number decreased by nearly $1,000 million by 1932. With imports valued at $1,388 million in 1929, the government “needed to cut foreign purchases by 70 percent – to maintain debt-service payments”, to account for this decrease in exports. Although relative to other countries in the region, Argentina managed to emerge from the Great Depression mostly unscathed, as unemployment levels never rose above the 10% mark, the country’s political climate had drastically changed in a few short years. With the economic slump of 1929, political extremism, violent protests, and widespread unrest became daily occurrences. In ‘A New Economic History of Argentina’, Argentinian author and economist Gerardo Della Paolera explains that “Argentina was one of the most stable […] countries until the Great Depression, after which it turned into one of the most unstable.” This lack of economic and political stability polarized the typically centrist Argentine populace, and led to the popular support of a military coup in September of 1930. This coup not only marked the beginning of Argentina’s economic free-fall and struggle to find apt leadership, but also of a progressive loss of confidence in the government. It is hence rightfully referred to as the beginning of ‘La Década Infame’, or the infamous decade. 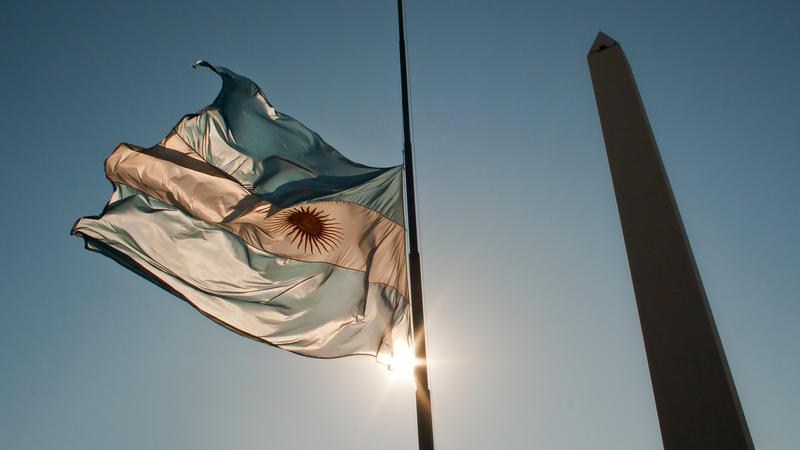 La Década Infame ushered Argentina into an era of political incompetence and near constant turmoil, and though this decade officially ended in 1943, various violent dictatorial regimes remained in control of Argentina for more than 50 years. Following the coup of 1930, like many other countries in the region, the Argentinian government immediately began to combat the effects of the Great Depression by investing heavily on import substitution. This investment was made at the expense of agricultural production, which had previously been the pillar of the Argentinian economy, as the country was the leading exporter of corn, flax, and meat at the turn of the century. The era of import substitution lasted well into the 70s, a period during which the nation’s government protected local production from foreign competition by in-storing high tariffs on imports. This era did enable Argentina to become largely self-sufficient in terms of consumer goods, and to progressively make manufacturing the largest component of the country’s GDP, which were its original goals. Although the objectives of the import substitution era were attained, once the policy ended in 1976, Argentina’s economy crumbled. The government lifted its import barriers and Argentina’s bloated government expenditure, astronomical wages, and largely inefficient production schemes combined to cause chronic inflation, which continued to rise throughout the 1980s. During that period, Argentina’s yearly inflation rate averaged a remarkable 300%, but worse even, for a brief period in 1989, the government completely lost control of the economy, and the inflation rate surpassed 1000%. This flagrant inability to rein in inflation levels, combined with the volatility of Argentina’s currency, with succeeding governments in-storing new currencies to reduce inflation, forced many Argentines to look overseas for investments. During periods “when the government allowed Argentinians to convert their pesos into dollars and take them out of the country, people who had financial wealth moved their money into investments in the United States”, which created yet another strain on the already fragile economy. Not only did this highlight an ever growing lack of trust that Argentines had in their government, but it demonstrated that governmental incompetence had led to economic disarray, but the nation now lacked the capital to recover. Following the hyperinflation of 1989, and yet another political shake-up, the newly appointed President decided to implement ‘shock programs’ to further liberalize the country’s economy. Unsurprisingly, not only did this not work, but it led to another “bout of debilitating hyper-inflation, which reached 12,000 percent per year”. Ultimately, Domingo Cavallo, the Minister of Finance at the time, was forced to step in to stabilize the nation’s economy. He introduced a new currency board in April 1991, and pegged the previously over-inflated peso to the US dollar, at a value of one to one. Although this peg was a successful solution for a few years, the appreciation of the dollar at the same time as Argentina experienced it’s own ‘Great Depression’ ended the peg, and the peso immediately started inflating again, as Argentina’s longstanding economic issues were not solved. Following the fall of the peg, the government approached the International Monetary Fund (IMF) for assistance, and following lengthy discussions, the IMF presented Argentina with a 3 year $7.2 billion loan, conditional on a GDP growth of 3.5%. Argentina’s economy was unable to regain momentum with the loan, and even with further assistance, the economy seemed doomed. In a tragic turn of events that plunged Argentina in its worse recession ever, all parties, local and foreign alike, lost all faith in the government’s ability to recover from current economic downturn. At the time, the New York Times published a piece which detailed how “Argentines withdrew more than $500 million from bank accounts because of fears that banks with large holdings of government bonds might collapse. Overnight interest rates rose as high as 200 percent”, which coincided with the Argentine debt being massively shorted on Wall Street. This combination left the Argentinian government unable to borrow or pay back its loans, and caused a complete secession of the IMF’s aid, which forced the government to impose a near complete freeze on bank accounts nation wide, a policy which became known as the Corralito. Within a year, Argentina’s economy had shrunk by 20% from its pre-recession levels, and unemployment rates spiked to more than 50% in October 2002. This period saw so much political instability that in January of 2002, Eduardo Duhalde was the fifth President appointed in two weeks. President Duhalde later appointed Roberto Lavagna as Minister of the Economy, a position that he would use to finally stabilize the nation’s economy, as it reached a breaking point. Although with Lavagna’s help, the economy mostly recovered, Argentines lost all remaining faith in their government following the Corralito fiasco. Following its stabilization, Argentina’s economy experienced relative growth, but it’s inflation levels continued to be problematic. These levels were consistently downplayed and distorted by the nation’s government, and little was done to solve the longstanding issues causing this inflation. Once Mauricio Macri was appointed in 2015, he removed the distortionary price subsidies that previous administrations had put in place, and the country’s inflation rate rose back up to 40%. Although Argentina has not experienced such explosive economic downturn as it did at the turn of the millennium, memories of these dire times are still fresh in the minds of Argentines. The fear that these decades of governmental incompetence and poor economic policies (most notably in the form of the Corralito and the import subsidy era) are central reasons for the lack of trust and commitment that Argentines have in their government and its’ initiatives. Latin political critic N. P. Flannery recently questioned “if voters will give President Mauricio Macri a chance to try and fix the serious structural economic problems he inherited from his predecessors”, or if the fear of austerity measures a-la-Greek will push voters towards populist parties at the next general election. President Macri has attempted to reach agreements for loans with the IMF, however his constituents have been abundantly vocal about their disapproval of another deal with the IMF. As The Economist puts it “Many blame the fund for imposing austerity in return for loans and then pulling the plug in 2001, tipping their country into a devastating $82bn sovereign default”, which leaves Argentina’s future in an uncertain position. Some experts have been predicting a resurgence ever since Macri’s election, but inflation levels continue to remain stubbornly high. Most recently, in late August, after experiencing yet another bout of deflation, where the peso hit an all time low, the government was forced to raise interest rates to a staggering 60%. The government is now at an impasse, it cannot hope to pay back its loans with the peso’s current value, and is hence being forced to seek further IMF assistance, a prospect that many Argentines are refusing to consider. In an attempt to garner some popular support, and begin to reduce its deficit, President Macri has decided to dramatically reduce the government’s size. As he put it during his recent plea to Argentina to hold strong and not lose faith in its government, “Given what is ahead of us, I have decided to make my team more compact, in order to focus our response on our upcoming agenda,”. In the coming days, Macri hopes to introduce a new currency board, to hopefully once again stabilize Argentina’s struggling currency. Although this may once again create a short term solution, Argentina’s economy remains incredibly susceptible to economic downturn, which threatens to dip into hyperinflation at any moment. Argentina’s economic downfall presents itself as a shinning example for the cost of governmental ineptitude, and its potential ramification on generations to come. Mistakes that were made nearly a century ago, and that were never actively resolved, continue to haunt Argentina’s economy, with no sign of betterment. Despite President Macri’s valiant attempts to create an investor friendly economy, the lack of trust and commitment that his compatriots have in their government will continue to plague his office for the rest of his mandate. At this juncture, Argentina’s past seems to have doomed its economy to a downward spiral of inflation, while lacking the means to escape it, a situation that stands as a cautionary tale for the exorbitant cost of governmental ineptitude. Matthieu Manzoni is a U3 student currently pursuing a degree in Sociology and Psychology. From France and Canada, but having grown up in Singapore, he has a specific interested in East to West international relations, South East Asian policy making, as well as ethical issues of the modern society. When he is not writing for MIR, Matthieu is most likely on his quest to find The perfect pasta recipe.